Tengok Wanita hari ini de radz radzwill ...u de x gamba kaftan dress koleksi dia? design rico superb! new comer at hijabstyle, I'm really glad to discover this site!!! the models showed at islamic fashion festival are just lovely!! colors, shape are just beautiful! Wow! Colorific!! I love the black and grey piece, not sure about the embellishment on it though :(. Those desingers are really creative. very beautiful! but there must be more than one definition of "modest" because other than covering skin, the designs are very "showy" ! 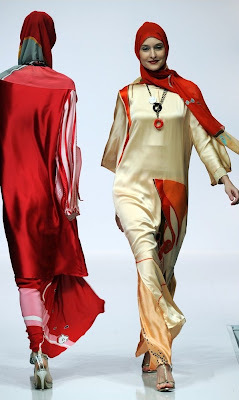 From Malaysian designer, I prefer Tengku Marina from Pink Jambu. Very simple cut, flowy and vibrant colour with lovely batik prints. And the models wear almost perfectly covered scarves which is something I look forward too. Indonesian, I prefer Jeny Tjahyawati's. Cute pastels and quirky embellishment. Adorable blouse too. I noticed that during MiFA or any muslimah fashion show, quite a few designers who misinterpret muslimah's fashion into some kind of a weird lines with hideous head gear. I hope they one day know that muslimah's fashion does not only cover hairs, but also neck, chest and skins. anyway nice collection. I dunno where to view these kind of collection.